Recursion is an important programming technique in which a function calls itself. While it can be used in many situations, it is most effective for solving problems involving iterative branching, such as fractal math, sorting, or traversing the nodes of complex or non-linear data structures (such as binary or prefix tries). 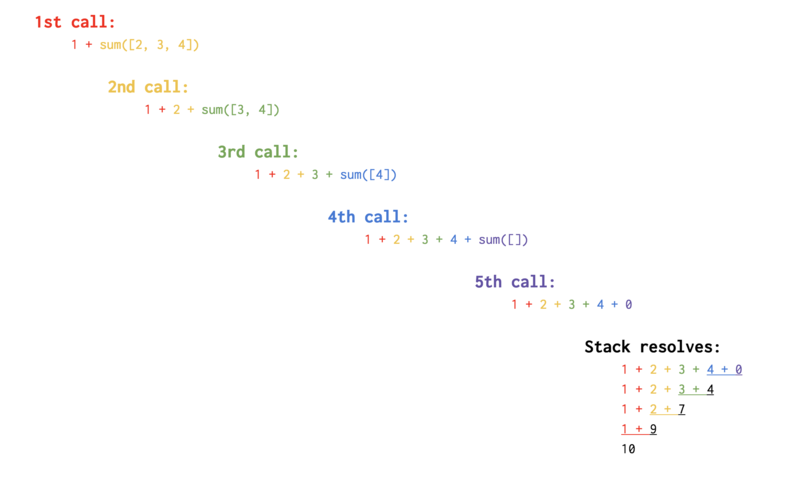 The best way to start understanding recursion is to just try doing it! Let’s write a function that counts down to zero from a number we’ll pass in as an argument. Try solving this using an if statement, and then try solving it using a while loop! Once you’ve solved it, try changing the function so that instead of logging each number to the console, it creates an array for us. Create a function that takes in an argument of an array of numbers and adds them together. One of the most basic patterns of recursion is when you can reduce a problem to a smaller one and then keep reducing until you can’t do it anymore. This is also known as natural recursion. Calculate a number to a specific power.